Emerging markets streaming service iflix is teaming with the Indonesian Agency for Creative Economy (BEKRAF) and the Indonesian Film Board (BPI) to produce a slate of five films from young Indonesian talents. The first project, scheduled to start production before the end of 2018, will be a family film based on the contest-winning song, This Is My Holiday, composed by Stephen Irianto Wally. The song was selected from more than 1,800 individual submissions from young artists in a nationwide competition, Lomba Cipta Lagu Anak 2018, sponsored by Indonesian president Joko Widodo. BEKRAF will open nominations to young Indonesian filmmakers to submit their proposal to develop each song into a movie, with iflix as the lead investor. 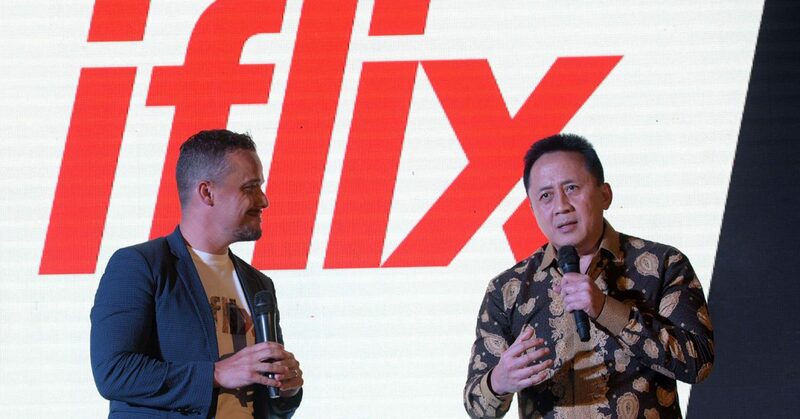 The series of co-productions will premiere exclusively on iflix’s platform in 2019.
iflix co-founder and group CEO, Mark Britt (pictured with Triawan Munaf) said: “Indonesia is Asia’s fastest-growing and most competitive market. Iflix, which is available across Southeast Asia, Africa and the Middle East, is planning to invest $40-50m into local-language content in Indonesia, both through original productions and acquisitions. BEKRAF (Badan Ekonomi Kreatif Indonesia) is a specially formed government agency under the President of Indonesia that is responsible for the development of Indonesia’s creative economy. BPI (Badan Perfilman Indonesia) is an organisation representing the Indonesian film community, which has a mission to be a strategic partner of the Indonesian government in conducting various film-related programmes.